Football players are at high risk of traumatic brain injuries (TBI) on the field during play and practice since frequent head impacts are an unavoidable part of the game. Currently, researchers are still learning about the long-term impact of these injuries on players, and a long-term treatment has not yet been fully developed. Over the last three years, the Football Players Health Study has been studying this very important area. Our researchers Drs. Xiao Zhen Zhou and Kun Ping Lu from Beth Israel Deaconess Medical Center in Boston have been working on a medical treatment that, in the future, might be available after head trauma occurs. Recent studies in mice by Drs. Zhou and Lu provide evidence that frequent TBI—even minor injuries—eventually lead to brain damage due to the build up of a toxic protein in the brain. The toxic protein, called cis P-tau, is released after head injuries. Some people’s bodies have trouble getting rid of the protein, so over time it accumulates and this can cause neurological symptoms. After the researchers found the link between the toxic protein and brain damage, they began searching for a treatment. They discovered an antibody that can recognize the protein and remove it from the brain. When Drs. Zhou and Lu treated mice that had experienced repeated minor TBI with the antibody, the treatment successfully prevented long-term brain damage and disease. 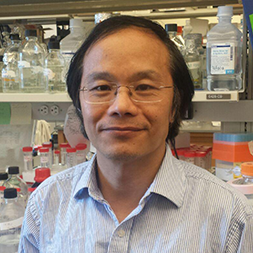 “In the mouse model, this antibody seems very effective,” Zhou says. These animal studies are promising. However, the antibody still needs to be tested in humans before we can be sure that it is a safe and effective therapy option for players. Drs. Zhou and Lu are hopeful that their antibody will be available for human trials within the next five years.